Kosovo’s biggest daily newspaper has published a full-page appeal from Austria not to waste time and money trying to get asylum in the EU. The call comes after a surge in the number of Kosovars smuggling themselves out of the impoverished entity. "Smugglers are lying. There will be no asylum for economic reasons in Austria. For staying illegally in Austria, you may be punished by up to €7,500 ($8,481)," Reuters cites the appeal published on the third page of Koha Ditore. In 2012 Serbia, which considers Kosovo its own territory illegally taken away by separatists, allowed Kosovars to travel more freely through its territory with previously unrecognized Kosovo-issued documents. Since then thousands of people rushed from Kosovo through Serbia to seek a better life in various EU countries, with Germany and Hungary dealing with the biggest influx. Austrian Interior Minister Johanna Mikl-Leitner raised the issue of asylum seekers during his Friday visit to Pristina. "We will have a charter plane every two weeks and if there is a need we will engage more planes," he said. "We are discussing turning these people back also via land routes, but we have to talk to Serbia about this." Mikl-Leitner said that this year alone, 1,800 Kosovars had applied for asylum in Austria, compared with 1,900 for the whole of 2014. Germany in 2015 was overrun by some 20,000 Kosovars seeking asylum. It announced it was sending 20 police officers to the Serbian-Hungarian border to stem the flow of refugees. 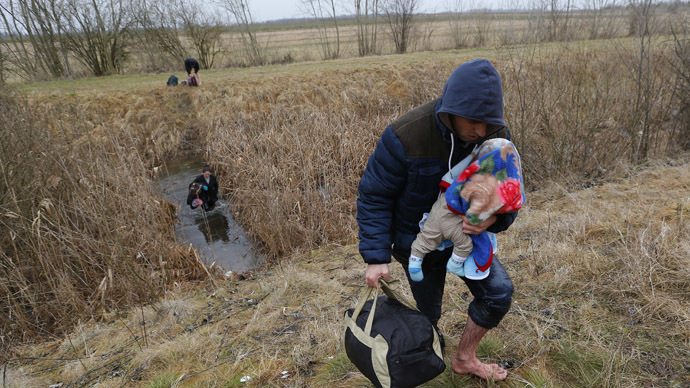 There are some 11,000 Kosovars registered for asylum in Hungary as of January. Local police reported detaining nearly 8,000 immigrants in just one week of the month.